Pieces Recovered From 1945 UFO Crash and Test Results to be Revealed! So I click on the link in the invitation and find myself reading about the "two little Hispanic children" living "in the shadow of Area 51" who witnessed an "extraordinary event," a 1945 UFO crash that took place outside San Antonio, New Mexico. My curiosity was piqued, because I didn't realize that little Hispanic children were ever living in the shadow of Area 51. I'm glad they were in the shade, at least, but still. How long were they living there before the guards discovered them? But I digress. As I started reading about the 1945 San Antonio crash and the debris that will be on display at the Symposium next month, I started wondering how many other UFO crashes have taken place that I didn't know of. Surely someone had put a list together? 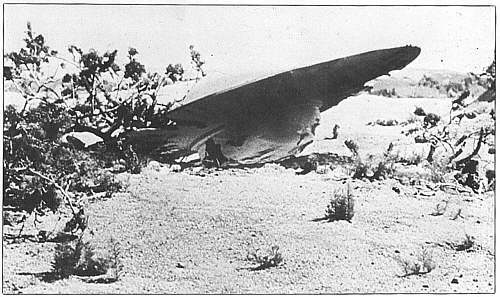 UFO crash: not as rare as you think. Turns out, UFOs are always crashing all over the damn place. Lots of people, it turns out, have put lists of UFO crashes together, but as so often happens in UFO world, none of the documents agree... One list goes up to 272 crashes, another lists only 34, some lists aren't numbered and I refuse to count them myself, while some are all but unreadable. Some of the lists include the status of recovered disks and the amount of alien corpses from each crash, which is pretty cool. By my count, we earthlings have in our possession three (3) intact flying saucers and 138 alien bodies in various states of aliveness or deadness. Also, there seem to have been 31 flying saucers that did not survive their crashes, but that presumably left behind at least a little wreckage or debris. This in interesting, too: according to one list, there have been a great many crashes with a dozen or more alien corpses discovered in the wreckage; one had 19 (all dead)! Don't get too excited, though: the corpses have all been shipped to Great Britain, one list tells us, "for storage and examination." But here's the really stupid part, so stupid it must be italicized: none of these lists include a saucer crash in San Antonio, New Mexico in 1945.